Although many solar cooking enthusiasts use dark, lightweight cookware, I recently came upon several deeply discounted, black cocottes at TJ Maxx, and bought them all. 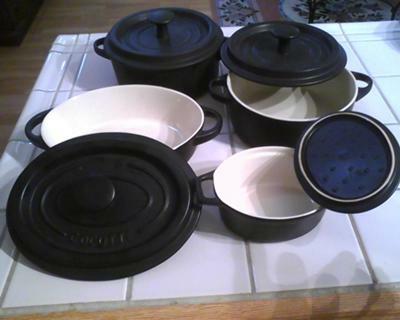 Normally these cast iron casserole dishes go for $60-100, but at $6.99 for the small one, and $9.99 for the larger ones, how can you go wrong? As you can imagine, these pots should sit in your sun oven, preheating, while you prepare your ingredients. Once in the oven, I did not see any difference in solar oven performance. In fact, these cocottes hold heat for a long time after removal, keeping the food hot for buffet style servings. They are also easy to clean. While you're doing your Christmas shopping, keep an eye out for this type of cookware. This Thanksgiving, I skinned sweet potatoes, and cubed them. After cooking in my sun oven for one hour, I removed the cocotte, mashed the potatoes in place with a fork, sprinkled brown sugar and cinnamon on top, and cooked for another 30 minutes. Delicious. Thank you for that great information. Those cocottes sound like a great item for solar cooking. And yes, you are correct in stating that it is helpful to preheat them since they are cast iron and do take longer to heat up. The dish sounds very delicious, I am glad you were able to solar cook on Thanksgiving as well. We used our parabolic on Thanksgiving to fry up some scones to accompany our meal and corn in the Sun Oven. I have actually used my cocottes the majority of the time, but I do preheat them for an hour (costs nothing) before I fill them. I drop my ingredients into a searingly hot cocotte most of the time. Don't want to give anyone the impression that you can put things like chicken into a cold cocotte, without some food safety concerns. I want my food to get through the "danger zone" as quickly as possible. Nathan, I also used my solar parabolic to fry up over a dozen eggs in the Vegas morning sun, turning a house full of guests into solar cooking believers.